inherent interest in the subject of human development, encouraging them to draw connections between the material and their own experiences.MyPsychLab is an integral part of the Feldman program. 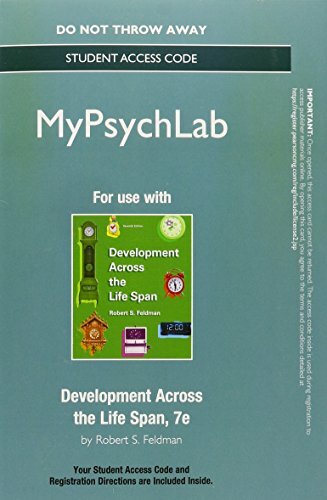 Key learning applications include, MyPsychLab video series, MyVirtualLife, and MyVirtualChild.This text is available in a variety of formats - digital and print. Pearson offers its titles on the devices students love through Pearson's MyLab products, CourseSmart, Amazon, and more. To learn more about our programs, pricing options and customization, click the Choices tab.Teaching & Learning ExperiencePersonalize Learning - MyPsychLab is an online homework, tutorial, and assessment program. It helps students prepare for class and instructor gauge individual and class performance.Improve Critical Thinking - Review and Apply sections - Consist of short recaps of the chapters' main points, followed by questions designed to provoke critical thinking.Engage Students - Chapter Opening Prologues - Describe an individual or situation that is relevant to the basic developmental issues being addressed in the chapter.Explore Research - From Research to Practice boxes - Describe a contemporary developmental research topic.Support Instructors - A number of Instructor Resources including PowerPoint Presentations, MyTest Test Bank, and Instructor's Manual. Identity: Asking "Who Am I?"